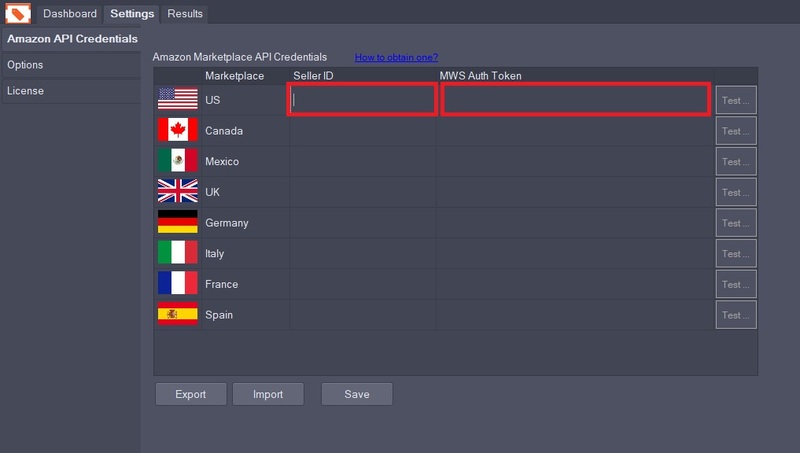 Once you have purchased a license for AMZ Analyzer, you will receive a purchase receipt email that includes a download link as well as your License Key. Click the Download link and install the program. Once installed, open the program. Download link and license information can also be obtained anytime on the website by logging in and visiting the My Account page. 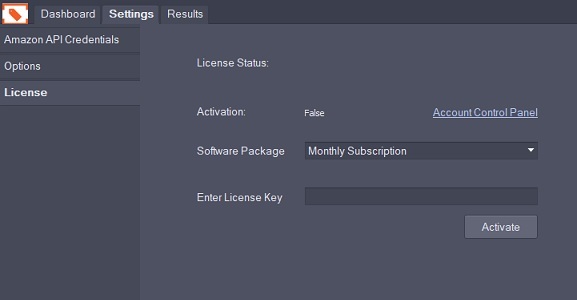 Copy the License Key you received in the purchase receipt and paste into the program “Enter License” field. 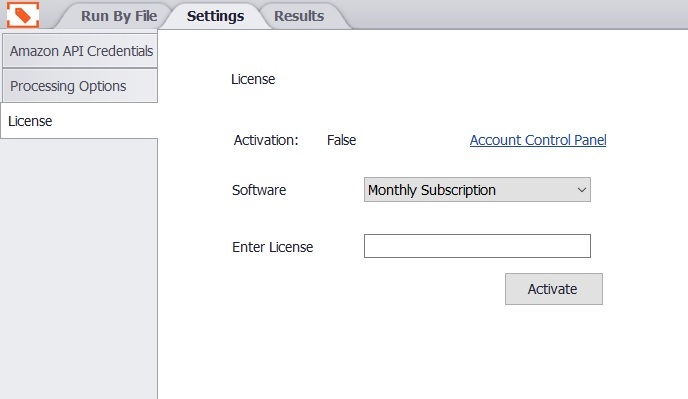 Select your license plan (Monthly Subscription, 2 Day Pass, 5 Day Pass) from the “Software Package” drop down menu. Click “Activate”. “Activation” will turn from False” to “True” to indicate the license is valid. Visit the link(s) below based on the Marketplace(s) you are authorized for. You may be asked to log into your Seller Central account. Be sure to use the correct region link or your authorization will not work! North America (includes Canada, US, and Mexico): Go to this Registration link. Europe (includes Spain, UK, France, Germany, and Italy): Go to this Registration link. Copy into Settings > Amazon API Credentials screen under the appropriate Marketplace. Seller ID should be pasted first, followed by the MWS Auth Token. Once pasted, click on “Test…” to confirm successful authentication and “Save” to finish the process. You can now bulk search lists of products on Amazon by uploading a product spreadsheet, research with Browser search and analyze your competitors’ storefronts with the Competing Seller functionality, all from the Dashboard tab! 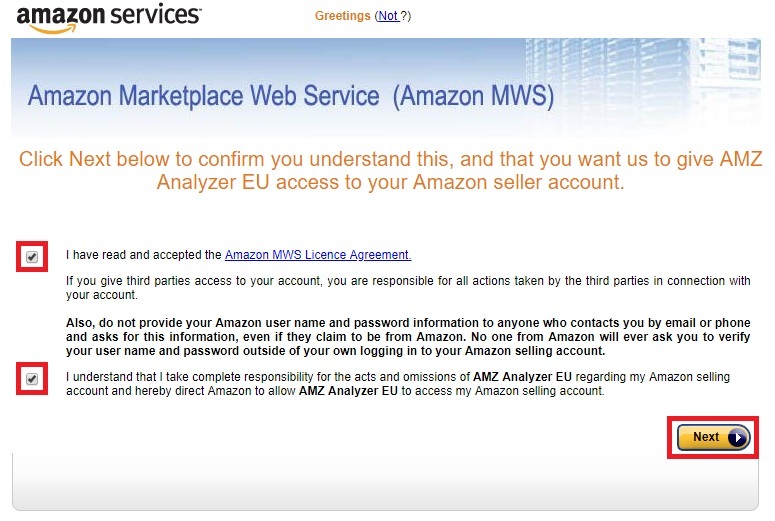 Analyzer.tools and its operators and affiliates are not affiliated or funded by Amazon.com, Inc., in any way.